A beginner in the world of trading would definitely come across a simple moving average crossover system. The system, which involves buying or selling an asset based on whether the short term moving average crosses above or below the long term moving average, is one of the easiest ways of trading in the market. However, the moving average crossover system has lots of drawbacks. Thus, practically, it may be of little use to a day and swing trader. The 5 EMA (Exponential Moving average) trading system described below practically solves most of the issues, which are common with simple moving average crossover systems. Why should we use an exponential moving average? To understand the need to use an exponential moving average, let us quickly refresh ourselves about simple moving average. A simple moving average is nothing but an arithmetic mean of a set of values. For example, to calculate a five-day simple moving average, the closing price of the past five days is added and divided by five. The resulting value is plotted as a dot in a chart with time on the X-axis and value on the Y-axis. The same procedure is carried out on the next day to get the next point to be plotted on the chart. The two points are now connected to visualize the trend effectively. As it can be seen, the calculation gives equal weight to all the closing prices used for the calculation. However, in reality, there may be situations where unexpected news, announced recently, would have resulted in large price swings. Since the calculation does not give any special preference to the latest price, the outcome of the calculation will not reflect what is currently going on in the market. This is technically called the lag. Common sense dictates that better trading decisions can be taken when the lag is brought down to minimal. This is where an exponential moving average (EMA) can be advantageous. An EMA gives more weight to the recent price data. Thus, it responds quickly to changes in the price action scenario. Mathematicians have successfully tackled the issue of lag using advanced calculations. This has led to the creation of several other types of moving averages such as linear weighted, the triple moving average and hull moving average to name a few. However, a majority of the traders prefers EMA for the simple reason that it does not decrease the lag to the extent of creating too many whipsaws in the trading system. Professional traders can vouch for the fact that a certain amount of lag is absolutely necessary and EMA perfectly fits their requirement. When the short-term and medium term moving average crosses above the long-term moving average, it gives a reliable buy signal. Similarly, when the short-term and medium-term moving average crosses below the long-term moving average, it gives a reliable sell signal. This theory is applied to create the 5-EMA trading system. 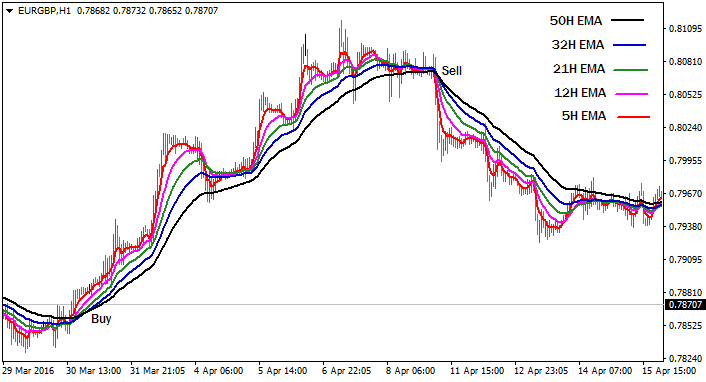 The trading system makes use of five EMAs representing the short-term, medium-term and long-term trend. The short-term EMA is drawn using a time period of 5 and 12. The medium-term EMA is drawn using a time period of 21 and 32. The long-term EMA is drawn using a time period of 50. Now, a long position is taken after the 5, 12, 21 and 32 period moving average crosses above the 50 period EMA. Similarly, a short position is opened after the 5, 12, 21 and 32 period moving average crosses below the 50 period EMA. A one-hour (H1) time period would complement the system very well. A 60 pip stop loss order is suggested for the system. The position can be closed when the short-term and the medium-term EMAs cross over to the other side of the long-term EMAs. Alternatively, the profit can be booked near the next major support or resistance (depending on short or long position). Shows the prevailing trend perfectly. Enables a trader to ride the trend without any kind of dilemma. Lot of patience is required to enter a trade. Using 5 EMAs ensures that a trade is taken only after clear validation of the trend. Similar to any other trading system, it has drawbacks as well. Only constant practice would enable a trader to filter out the signals provided by the crossover of the EMAs.